[su_wiloke_sc_company_website]Known for its scenic beauty, this is Philippines best natural asset. A hundred islands national park Philippines is a national park and one of its kinds in the Philippines. 123 small islets look like mushrooms when viewed from a far distance. Out of these 123 islands, the local authorities have developed 3 for the tourist. People from all around the world come to this place for shopping, camping, and hiking. This site is a real destination when it comes to striking natures force that has eaten up most of the bases of the islets. The islands are green, and the fauna attracts many people to its vicinity. Comfortable stay provided by some of the most beautiful hotels makes it the best place to visit this fall. The best time to visit hundred islands national park majestic place is during the winters when the temperature cools down. During the winters many fairs and events take place in this place. With the number of people coming to this place this time of the year, it is essential for the tourist to book their tickets early. The summer starts here from March to September. The winters commence in November and the month of December is the month when maximum visitors go to this place. Christmas holidays are the best time to this beautiful destination in the Philippines. History of the place and the name: The name of this hundred islands national park came from the number of islands. There are about 124 islets in this situation. Out of which 123 are visible during high tides. You can see all 124 during the low tides. This place was created by Presidential Proclamation No. 667. This was in the year 1940. Since then there have been many changes to the authorities and year after year many amendments came to force. But at present, it has been a perfect tourist destination in the Philippines. A Hundred islands national park Philippines is pretty because of the green lush that is quite visible from a long distance. Also, some of the islands are developed well by the government so that the tourist can enjoy and relax in these places. In the year 1991, there was an act that transferred the power and authority of this site to the local authorities from the national government. Hundred islands national park place is very famous for its flora and fauna. Some of the rare species of plants are there on the island. Every year thousands of tourists come to this place to witness this extraordinary natural beauty. Among all the islands there are three which are developed well by the local authorities. These are the Governor Island, Quezon Island, and Children’s Island. This is a national park that is located in the city of Alaminos which again is in the province of Pangasinan. This place is about 150 miles from Manila. These islands are approximately 2 million years old according to the researchers. The corals make it a majestic place. During the moon, the heavy rainfall sometimes makes the tours a bit gloomy but other than that rest of the year it is quite good for travels. Island Hopping: There are several islands where you can go for Island Hopping. This is the best thing you can do here as probably best in the world. Experiencing these islands is one in a lifetime experience. Many tourists come to this place for hopping. You can avail three islands for hopping that include Governor Island, Quezon Island, and Children’s Island. There are boat rides available in this place. You can rent a boat to these islands. In a boat at a time 5-15 people can travel depending on the size of the boat. Boating: Well! What can be the alternative to a boat ride that too when the destination is an island? This is what makes this boat rides so popular among the tourist. There are three types of boats such as the small boat, medium boat, and large boat. The small boats can be availed at p800 while the medium at p1000 and the large one that carries around 15 passengers at p1200. There are many boats that you can avail, and the staff is the best in the business. They know what to provide to their customers. Marta Island: Among all islands, there are only a few that can be accessed as the local government develops these for tourist. Marta Island is one of those islands that have been conserved well by the local authorities. This is made of two islets which are connected by a strip of sand. You can avail boat ride to this place where you can hop from one island to the other. This site is also one of the perfect places for photographs. The sand strip that connects the two islets makes the view a stunning view. Cabarruyan Island: The Cabarruyan Island is the largest of all the 124 islets in this place. This island is known for its extensive area and also very popularly called as the Mother Island. This one is located in the northwest of the national park. Here too you can hire boats to reach the island. You can also go for the service boats that are quite popular here in this place. Camping is one favorite thing that people come here to do and spend time with their friends and family. The rates are also quite reasonable in this place, and that is why availing all the best places, and things are not that difficult here. The fauna: As islands are very popular for their flora and fauna, these islands are also very famous among the people because of the different types of plants and animals that can be seen In the year 2010, there was an extensive research conducted by the Marine Environment and Resources Foundation Inc where some amazing species came into the picture. Here are some of the favorite wildlife creatures that are available in this place. Olive ridley sea turtle etc. Camping – Camping is one of the popular things to do here. Many tourists come to this island for camping. Some officials can help you to rent tents from the local authorities. You can go for the big isles for camping, or else a beach is also a fantastic place to camp. There are many uninhabited islands where you can spend your night, but you need to let your officials and the boatmen about it. They can help you with the tour and make sure your safety is not compromised. Go shopping: Although it is not possible to get fancy malls here as hundred islands national park place is kept natural, there are many small stalls and shops where you can buy some interesting artifacts. It is always the best thing to do to buy something from the place you visit and make sure that you buy something that will still make you remember this site. There are also several street stalls that serve excellent local cuisines. You can go for some of the local delicacies in these booths. Marcos Island: The Marcos Island is another trendy island here in this place. 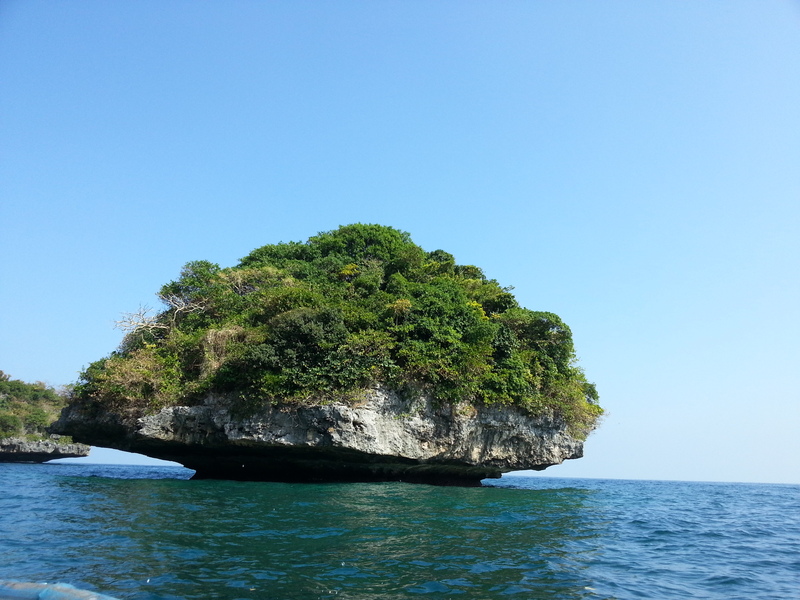 This island is famous because of its vertical shaft rock from where you can jump into the sea and swim. The scene is mesmerizing as there are so many green trees on this island and the black stones make the base a stunning spot. This is also a very good place for you to go for a camping night. Get your barbeque and spend the night on this island. Scout Island: This Island is known for its cave with a blowhole. Quirino Island: Quirino Island is another popular island here and is known for its cave. Cuenco Island: This particular island is known for its cave that goes straight through the island. Visiting this island is a never forgetting experience for the visitors. 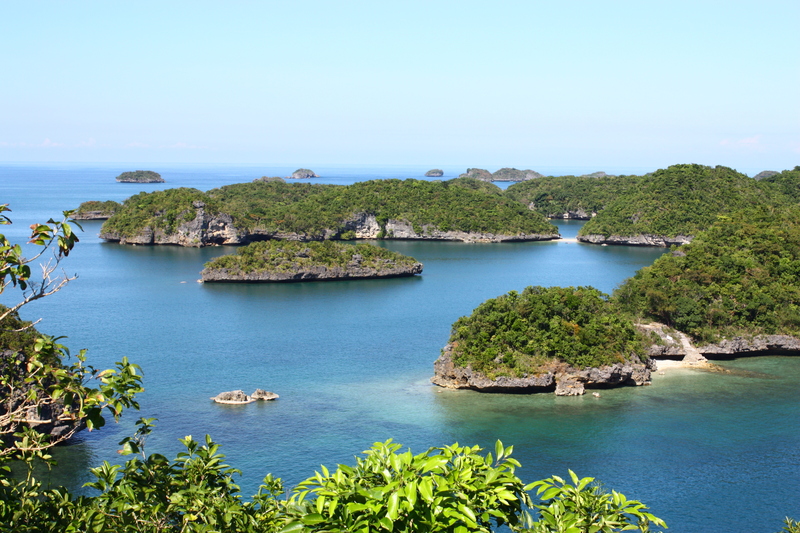 How to reach this beautiful Hundred islands national park? From Manila: Once you reach Manila, there are several ways you can go to this place. You can avail public transportation to reach this place. There are bus rides available from Manila to this place. These bus rides are also perfect as the scenery on both sides of the road makes it’s the unique bus ride. It takes around 5 to 6 hours in these public buses. By Private Vehicle: Several taxi agencies provide taxi services to the people. If you want to cut down your time to reach this place, then go for taxi rides. It takes around 3.5 hours to reach this place by Private Vehicles. Travel agencies: There are several agencies such as Victory Liner Inc and Five Star Inc that provides trips to this place from Manila. They charge around P300 to P380 per person for these trips. By tricycle: This one too is a fantastic experience. You can avail a tricycle ride from Alaminos bus terminal to the National park. Nautilus Island View Lodge: The Nautilus Island View Lodge is probably the most popular hundred islands national park hotels in the business. There are many things that make this place the best for you’re staying. There are suites and rooms with Ac available in this hotel. Amenities such as hot bath, Wi-Fi, and laundry are available here in this place. Treasure Isle Guest House: Known for its excellent location this is another very popular hotel where you can stay. The amenities are the international standard. The fare to is reasonable, and that is why most of the people who come for the budget tour like to spend their time here in this hotel. These are very famous hundred islands national park hotels. Traditional Filipino Hotel: The Traditional Filipino Hotel is another favorite hotel here. You can stay here and avail AC rooms. The charges are quite affordable, and they provide excellent amenities. Parking space is available here in this hotel. Maxine by the sea: This particular restaurant is known for its excellent ambiance. It is a perfect restaurant for a family. They serve both local and international cuisines to the customers. Vista Del Las Island: This restaurant is trendy among the people in hundred islands national park Philippines because of its local and authentic cuisines that they provide. The staff is also amicable in this place. Catch Restaurant Bamboo Paraiso: This particular restaurant is known for its cuisines, and the place is in a fantastic location. Avoid the monsoon: The best time as already mentioned above is during the winters. Make sure you avoid the rainy season as during that time the hundred islands national park is not that comfortable to hop. Book your tickets early: As the number of tourist visiting hundred islands national park is increasing every year, you need to book your tickets soon, especially during the Christmas holidays. Do not hike alone: As there are many uninhabited islands and places, it is not that safe to explore apart in hundred islands national park Philippines. Take a guide with you or officials can help you with your tour.